The brief career of Michelangelo Merisi da Caravaggio has taken its place as a turning point in the history of art. His short and violent life provides us with a story that is both sensational and dramatic and, four centuries on, his unique style of painting continues to demand our attention. For more on Caravaggio's style, see: Classicism and Naturalism in Italian 17th Century Painting. The Supper at Emmaus - a popular theme in Christian art - represents the story, told in St. Luke's Gospel when after the Crucifixion, two of Christ's apostles invite an apparent stranger, whom they have just met, to share their meal with them. When he blesses and breaks the bread, they realize that their guest is, in fact, the Resurrected Christ. St. Luke names one of the apostles as Cleophas, but he does not identify the other. "And their eyes were opened and they knew him and he vanished out of their sight." Behind them, the innkeeper gapes uncomprehendingly. Caravaggio has chosen to represent one precise moment, namely that fraction of a second after the two apostles have realized that they are witnessing a miracle of unimaginable power. He freezes that moment, renders it permanent and enables us to take our time, to consider the miracle and to experience for ourselves that sense of shock and astonishment that was felt by the two apostles. It is not certain for whom Caravaggio painted his Supper at Emmaus, but we do know that it was made in Rome, probably in 1602, at the height of the Counter-Reformation. The Council of Trent, established to combat the continued threat of Protestantism, had declared in 1563 "that by means of the stories of the mysteries of our Redemption, portrayed by paintings or other representations, the people are instructed and confirmed in the habit of remembering and continually revolving in mind the articles of faith ... also because the miracles which God has performed are set before the eyes of the faithful, that they may give God thanks, and may be excited to adore and love God and to cultivate piety." It was a time when the church strongly felt the need to communicate its message directly to the faithful, through carefully composed religious art, and was demanding from artists a particular clarity of representation. Please see: Catholic Counter-Reformation Art (c.1560-1700) for details. In order to comply with this directive, Old Masters had to be, before all other things, realistic. Caravaggio's brand of realism was thus tailor-made for the Biblical art of the time. He was a painter whose directness and immediacy came in complete contrast to the sophisticated elegance and artifice of the later sixteenth century (see, for instance, the work of his contemporary Annibale Carracci 1540-1609), and the style of art known as Mannerism. Stripping away the pretensions of late Mannerist painting, which had become appreciated and understood only by an educated elite, he gave to painting the simplicity and instant impact called for by the church authorities. Caravaggio invests his religious paintings with a sense of powerful drama by means of his handling of light and shadow (chiaroscuro). "He never brought his figures out into the daylight" wrote Bellori, a seventeenth century writer on art, "but placed them in the dark brown atmosphere of a closed room, using a high light that descended vertically over the principal parts of the bodies, while leaving the remainder in shadow, in order to give force through a strong contrast of light and dark." The 'closed room' that Bellori mentions is a feature seen in many of Caravaggio's works. (See also: tenebrism.) A century or so before, during the era of Renaissance art, one of the main concerns of artists was the painting of distance or linear perspective. To Renaissance artists, the picture surface, in this case a piece of canvas, marked a barrier between the painted world and the real world. The real world, our world, exists on this side of the canvas, while safely behind the canvas Renaissance saints and apostles could be depicted, acting out their stories for us to observe, but never to enter into. It was Caravaggio's decision to challenge this convention, and to shut off the notion of distance in his paintings, by setting his figures against a wall that seems no more than a few feet behind the surface of the picture. Instead of arranging his figures within a lucid and expansive picture space, he crowds them in and forces them forward. Caravaggio does not want his characters to exist behind the canvas; it is as if he wishes to do the impossible and project them physically through that canvas and out into our own space. The extended hand of the apostle on the spectator's right appears to be almost touching the canvas itself, from inside the picture. (See also the technique of foreshortening.) The elbow of the other apostle looks as if it has actually torn through the canvas, an idea that Caravaggio emphasizes by the device of ripping the elbow in the jacket that the figure wears. Finally, the basket of fruit, balanced precariously on the edge of the table, seems to need only the slightest nudge to send it toppling and spilling its contents onto the floor below. And that floor is no longer the floor in the picture; but the actual floor in the real world, in our own space. Caravaggio breaks down the traditional barrier between what is real and what is painted and transforms a scene that happened in the past into something that is happening now, before our very eyes. The new religious atmosphere in Rome was ideally suited to respond to the vivid trompe l'oeil illusionism of Caravaggio's work. St. Ignatius Loyola's Spiritual Exercises urged the believer to engage all five senses when contemplating the Christian message. The faithful were encouraged not simply to learn the stories shown in religious paintings, but to imagine themselves as physically entering into these stories and undergoing the same experiences as the characters depicted. In pushing his figures and still life objects out into the world of the viewer, Caravaggio was providing exactly the kind of art wanted by the church in a time of fervent Counter-Reformation piety. But for many, Caravaggio's realism went too far. In 1602 he painted a St. Matthew for the church of San Luigi de' Francesi in Rome. It showed the bare-footed saint sitting with his legs crossed in a manner that made one foot appear to project out of the picture. The commission was rejected, according to Bellori because the priests said 'the figure had no decorum'. The priests apparently did not want a dirty bare foot, no matter how saintly, thrust upon them, and Caravaggio had to paint a second version where the saint kneels, politely keeping his feet to himself. The Supper at Emmaus was subject to similar criticism, particularly from Bellori. "Besides the rustic character of the two apostles, and of the Lord who is shown young, and without a beard, Caravaggio shows the innkeeper serving him with a hat on his head. On the table there is a basket of grapes and figs and pomegranates, out of season." 'Lack of decorum' was a criticism often aimed at Caravaggio. His tendency to show the apostles as dirty, ragged and unkempt was always likely to cause offence, as the story of the rejected St. Matthew shows. Bellori's concern that the innkeeper is serving Christ with a hat on his head represents a similar prudishness, and his criticism that the basket of fruit is shown 'out of season' reveals a rigorous desire for total accuracy in the depiction of the Gospel stories. The Resurrection is, after all, celebrated at Easter, in the spring, and Caravaggio has chosen autumn fruits. The choice of fruit on the table is, however, surely deliberate; for combined with the other items on the table, it has a symbolic meaning. The apple, here going rotten, is, of course, a symbol of the Temptation and of the Fall of Man. The coming of Christ is symbolized by the beam of light reflected through the glass vessel onto the tablecloth, which can be understood as a symbol of the Virgin Birth - the light penetrates the glass without breaking it - and the bread is easily recognizable as symbolic of the body of Christ, the Incarnation. Finally, the Sacrifice of Christ is symbolized by the grapes which Bellori criticizes. Grapes are the source of the wine, which becomes, at the Roman Catholic Eucharist, the Blood of Christ. Accordingly, Caravaggio has used the basket of fruit to emphasize and to underpin the meaning of the story that he paints. Caravaggio was born in northern Italy, and arrived in Rome in 1592, aged 21. His first years there were spent in poverty, and his earliest known paintings are of individual figures with still-lives. Some time in the 1590s, he was taken up by Cardinal Francesco del Monte, in whose house he lived. The Cardinal and his friends provided a ready market for these paintings, a fine example of which is also in the National Gallery, London, the Boy Bitten by a Lizard. By 1602, the approximate date of the Supper at Emmaus, he had established a reputation as a powerful, dramatic realist, but his lifestyle was causing equal attention and no little controversy. In October 1600, he had been arrested in a street brawl; in February 1601 he had attacked and badly scarred a soldier. He appears regularly in police records, for fights and assaults, for damaging his landlady's property and non-payment of rent, and for various quarrels that ended in violence. In May 1605 he was arrested for possessing a dagger and a sword without a licence. Similar events occur until he fled from Rome in spring 1606, having murdered an opponent in yet another street brawl. Caravaggio's lifestyle is not the kind that we associate with a painter of religious pictures, and many of his friends and acquaintances seem to have been drawn from the taverns of Roman low-life. It was these characters that he probably used as models in his painting. Rejecting traditional notions of preliminary sketching and compositional studies, Caravaggio worked directly onto the canvas, setting up the scene before him, almost as a kind of tableau vivant, and behaving, one imagines, like a director in a theatre, instructing his models how to sit, and which attitudes they were to hold. For the twentieth century, it is a compulsive story, of a man living in two worlds, sharing the sophisticated refinement of Cardinal del Monte and his circle, and yet becoming drawn to a kind of seventeenth century Roman nether-world, a world of squalor and violence. It is hardly surprising that his paintings, although ostensibly obeying the demands for Counter-Reformation realism, often caused offence. In a painting representing the Death of the Virgin, he is reputed to have used as a model for the Virgin Mary the bloated corpse of a dead prostitute. His work though is undeniably arresting and its effect on the next generation of artists was immediate, from Rubens (1577-1640) and Rembrandt (1606-1669) in northern Europe, to Velazquez (1599-1660) and Zurburan (1598-1664) in Spain. For Bellori there were perfectly good reasons that explained why so many Italian artists adopted his style. "Many artists were infatuated with his manner and accepted it willingly, since without study or effort, it enabled them to make facile copies after nature and to imitate forms which were vulgar and lacking in beauty." Like so much of the best modern art of any historical period, Caravaggio's Baroque painting attracted criticism for not being something that it never set out to be. His lack of idealism, despite being called for by the church, was felt to be vulgar. His imitation of nature was thought to be lacking those intellectual qualities which for many people were necessary to prevent art from becoming simply mindless imitation. 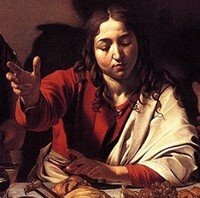 For details of Caravaggio's contemporaries, see: Italian Baroque Artists. In spite of these criticisms Caravaggio continued to be very much in demand. He received important commissions in Malta, Sicily, and Naples, places that provided him with refuge during his period as a fugitive. He died in 1610 of a fever, in Porto Ercole, shortly after the Pope had granted him special absolution from his crime and he could return to Rome a free man. To be given a free pardon for murder indicates how valued his paintings were by the Church. Certain refined seventeenth century sentiments may well have been upset by Caravaggio's direct assaults on the senses, but in their power to communicate their narratives immediately and forcefully, his paintings are as valid now as they were for their original audience. NOTE: Caravaggio produced a second, more subdued version of this painting, five years later. Contarelli Chapel, San Luigi dei Francesi, Rome. Cerasi Chapel, Santa Maria del Popolo, Rome.  For more about Caravaggism, see our main index: Homepage.